Above, the Republic of Korea's six-unit Yonggwang Nuclear Station. South Korea's nuclear energy program has both a varied history and a confusing (at least, for Westerners) structure; in order to properly assess this ambitious nation's program it is helpful to develop a clear and uncomplicated presentation on the program's history, status and goals. There is a need, for clarity, to omit some facts from this presentation; if everything were included, it would run for a week continuously. Atomic Power Review will give the important entities, developments and historical highlights so that readers will be conversant on an above average scale with the South Korean nuclear program should they read this entire post. In particular, APR is focusing on the increasing effort by South Korea (officially the Republic of Korea, or ROK) to export its nuclear power plant technology. The construction of a nuclear power station for the United Arab Emirates is at this point the ROK's highest achievement in that field; as a result, APR will focus on PWR development in the ROK (since it is Korean PWR plants which will be built there) and omit CANDU construction which the ROK has apparently ceased. We will briefly discuss entities involved with nuclear energy in the ROK. KEPCO - Korea Electric Power Corporation: The only utility company in the ROK. KHNP - Korea Hydro & Nuclear Power Co. Ltd.: Involved with construction and operation of nuclear power plants. Oversees all aspects of nuclear plant construction; co-ordinates the other project contractors. 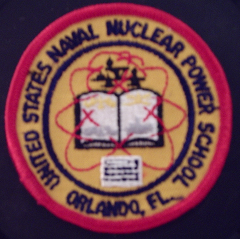 Operates nuclear power plants. Essentially acts functionally as owner-operator, but with some embedded A/E functions. KEPCO E&C - KEPCO Engineering & Construction Co., Inc.: This firm has two functions; first, it designs the NSSS or Nuclear Steam Supply Systems for nuclear power plants - in other words, the primary reactor plant. Second, it is also essentially what we in the USA would call an A/E or architect-engineer firm. Early work by this firm to build nuclear plants was in cooperation with Bechtel. Later worked with Sargent & Lundy. Formerly known as KOPEC. KAERI - Korea Atomic Energy Research Institute: A group with a long history, dating back to 1959. Provides R&D on nuclear projects of all kinds; relationship to the power reactor industry is focused on safety research and fuel development. Undertook project to develop capability to produce all nuclear fuel inside ROK; in the case of PWR type fuel, worked with KWU of Germany. KINGS - Kepco International Nuclear Graduate School: An intensive educational program to fill the world's need for highly skilled, competent leaders, project planners and engineers in the field of nuclear plant technology. All of the above entities are closely interrelated and even use variations of the same corporate logo on their websites and published materials. GABI - Global America Business Institute: This US firm is actually an authorized external representative for two Korean entities; for KAERI, and for the Korean Nuclear Society. DOOSAN HEAVY INDUSTRIES: ROK corporation that actually manufactures the primary reactor plant, and the turbine-generator as well. KHNP has certified a number of ROK companies to fabricate parts for various parts of nuclear power plants and the BOP or Balance Of Plant which aren't mentioned. Also, external firms can and do get orders for ROK-built nuclear plants. For example, Westinghouse will provide some major components to the UAE build. The above likely covers all of the entities involved with the construction and operation of ROK nuclear plants that you're likely to hear about in the press or even in inside-industry circles. It is important to understand that some of the entities have changed names over time, and that some functions have moved from one entity to another over time. We've omitted all of the ROK Rad Health entities and oversight entities for brevity. Let's now take a look at a very brief timeline covering major developments in the ROK's nuclear energy history. It could be said that the country's history comprised four phases: Nuclear aspirations, wherein it desired to have nuclear energy in the future; a turn-key period wherein fixed contract turn-key plants were built by foreign firms; a cooperative phase which was integral with the ROK desire to obtain technology transfer and become technology dependent; and finally the phase we are in now, where the ROK is fully capable of constructing the entire plant itself, and has full capability to develop advanced generations of nuclear plant designs. Here is a brief timeline obtained from printed materials distributed by GABI and by KAERI at the recent ANS 2012 Annual Meeting, supplemented by details from printed materials by KINGS and from the APR research library. 2009 ROK consortium wins contract worth $20 billion to build a nuclear generating station in the United Arab Emirates (UAE.) Beats bids from USA, Japan, France. Let's look at some details on the initial foray into atomic science in the ROK. We'll use the APR library; you can see the end of this article for a complete list of reference materials consulted for this project. Agreement for Cooperation: The ROK entered into an Agreement for Cooperation with the United States in February, 1961. This agreement was limited in scope to atomic research only and expired five years from the signing date. The agreement was amended at some point after signing, possibly to allow transfer of special nuclear material as required by our next point below. Research Reactor: The research reactor mentioned in the brief timeline was a General Atomics Triga Mk II and was located at the headquarters of what is now KAERI, in Seoul. This reactor was rated 100 KWt. The AEC's Research Reactor Grants program contributed $350,000 toward this project's costs. The Republic of Korea essentially went a decade between the construction of this foreign-built research reactor and the launch of the project to construct its first nuclear generating station. Now, we'll look at the progression of events concerning PWR nuclear plant construction and operation in the ROK. In 1972, construction began on the first nuclear power station in the ROK. This unit became known as Kori-1. This plant is a Westinghouse "turn key project" two-loop PWR rated 576 MWe net; this was the smallest standardized Westinghouse plant at that time. It is of interest to note that when General Atomics supplied the KAERI Triga II reactor for research in 1961, the entire electric generating capacity of the ROK was roughly 500 MW, which is less than the output of Kori-1 as built beginning a decade later. Kori-1 first achieved criticality in 1977, launching the nuclear electric generating era in the ROK. In that same year, 1977, construction began at Kori of a second Westinghouse PWR to become Kori-2. This was also a turn-key contract plant rated 637 MWe. According to an article published some time back by the Korea Herald, the decision was made in April 1978 to embark upon a massive program in the ROK to both spread the use of nuclear energy as a generating source and, perhaps more significantly, to initiate a process that would result in having a completely standardized ROK-built nuclear power plant design in production. Kori-3 was begun in 1979, and Kori-4 in 1980; these were further Westinghouse PWR plants, but were in the 1000 MWe class. 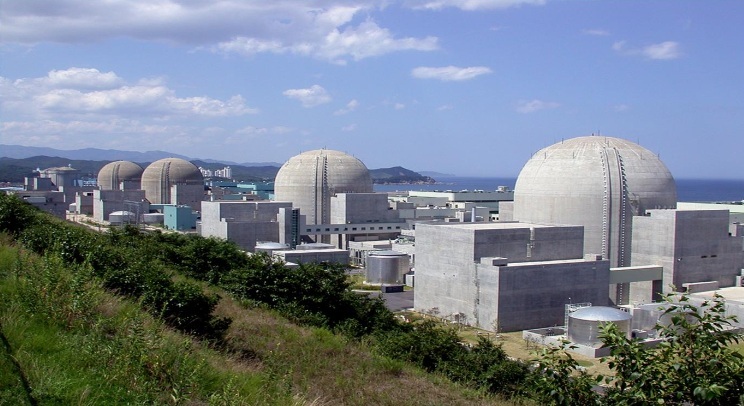 These plants were not turn-key plants, but rather were built more like US plants at that time with separate component bids and contractors, and included the first coordination of nuclear plant projects by Korean entities. However, this did not result in any nuclear technology transfer. Further plants built under the above arrangement included Yonggwang 1 and 2, both Westinghouse PWR plants rated roughly 950 MWe; construction started on these in 1981. Above, map included in GABI brochure on history of Korean nuclear plants. As with all photos this page, click to enlarge. 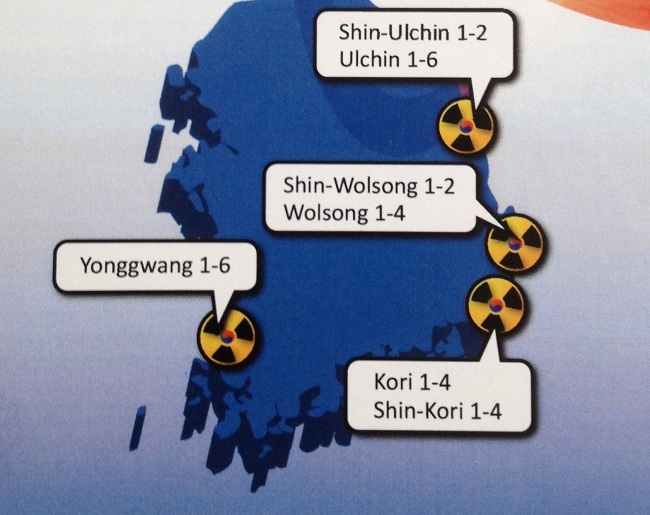 Nuclear stations including the name "shin" are essentially second near-by but not contiguous sites to earlier ones. In August 1982, the government of the ROK established a new plan for the long-term supply of electric power to a growing ROK both for industrial and residential use. 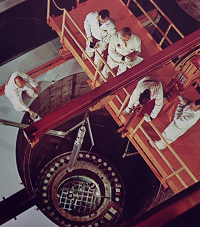 Under this new plan, nuclear energy was to continue to play an ever-expanding role but now it was required that technology transfer had to be included in new projects in order for bids to be accepted. Prior to the actual request for bids under this program, Framatome of France began construction of two units simultaneously at the new Ulchin nuclear station. Both were begun in 1983 and both were PWR's rated roughly 940 MWe. In October 1985 KEPCO issued its invitation to bid on the new construction program with technology transfer; bids were received from Westinghouse, from Combustion Engineering, from Framatome and from AECL Canada. Under the agreement, whoever won the contract would assist in construction of two further units at the Yonggwang site, which would essentially be the prototypes for the planned standardized ROK nuclear power plant as initially outlined by the requirement of 1978. Combustion Engineering (actually, ABB-CE at that point) won the bidding and a contract for Yonggwang 3 and 4 was signed in April 1987. The contractual requirement was for Unit 3 to be online in 1995 and Unit 4 in 1996. 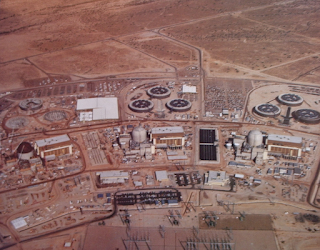 Construction of Unit 3 began in 1989 and that of Unit 4 followed the next year. 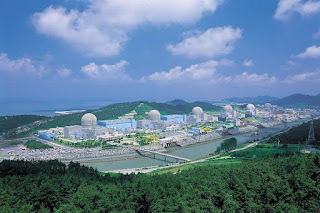 Yonggwang 3 and 4 are considered by the Korean nuclear industry to be the prototypes of the present power plant lines, or the "Reference Design." The NSSS of these plants is a downscaled version of the Combustion Engineering System 80 plant; the only completed CE80 plants are the three at Palo Verde; the turbine generator is a GE product, based on that provided for Perry; construction of the plants was assisted by Sargent & Lundy, using as references Yonggwang 1 and 2, as well as Byron and Braidwood in the United States. Above, Palo Verde (three CE80 units) while under construction, 1983. Some 193 patents and 4500 separate documents were transferred to Korea from ABB-CE as part of the technology transfer in order to develop indigenous nuclear generating station abilities on all fronts, from design and construction to operation and maintenance. 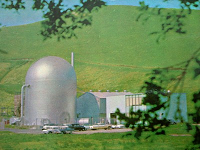 In May 1987 - only a month after the contract award was announced, with no designs or hardware in hand - the ROK launched a study into the feasibility of designing and constructing what would become the standardized ROK nuclear plant, at that time known somewhat generally as the KSNPP or Korean Standardized Nuclear Power Plant (sometimes, just "KSNP.") The decision was made to essentially directly transfer knowledge from the Yonggwang 3 and 4 project to this new effort as it came in, but also to incorporate all lessons learned and developments in real time. This effort was to lead to construction of Ulchin 3 and 4 next to the two Framatome plants that were more than half finished at the time. Into the effort to develop this design went new analytical codes, lessons learned from construction (and eventually, operation) of Yonggwang 3 and 4, data and lessons learned from the TMI accident, information obtained as a result of consultation with EPRI, various design improvements and updated building codes. All of this work resulted in what was originally known as the KSNPP but which is now generally known as the OPR1000, or the Optimized Power Reactor, 1000 MWe class. Yonggwang 3 and 4, the reference ABB-CE plants first started up in 1994 and 1995. Construction on the first two OPR-1000 units as Ulchin 3 and 4 finally in 1993, and these plants were first started up in 1997 and 1998. KHNP began to replicate the OPR1000 design in further projects: Construction of Yonggwang 5 and 6 began in 1997, while construction on Ulchin 5 and 6 began in 1999-2000. Above, Ulchin Nuclear Station. Furthest from the camera are the two Framatome PWR units; nearer are the four OPR1000 plants. After the design of the above round of plants was finalized, around January 1998, the ROK began a program to take all lessons learned from operating plants and those under construction to further improve the standard plant design. KHNC and KOPEC worked for four years to both improve safety and cut construction and operating costs, and a wide range of revisions to design was developed. This design is what is known as the "Improved OPR1000." Construction of the first I-OPR1000 plants was begun with Shin-Kori 1 and 2 in 2006 and 2007 (construction start dates) and continued with Shin-Wolsong 1 and 2 in 2007 and 2008. These four plants are the ultimate direct development of the original plan for a standardized Korean nuclear plant. In 1992, the ROK initiated a design program called the KNGR Project, for "Korean Next Generation Reactor," to determine what the next design for a standardized power plant would be. Three rounds of work carried out through 2001 resulted in the selection of a very large, two loop PWR in the 1400 MWe class with greatly enhanced safety features as the candidate. This design became known as the APR1400 or "Advanced Power Reactor, 1400 MWe class" and was granted Design Approval from the ROK government May 7, 2002. APR1400 construction began with Shin-Kori 3 and 4 in 2008 and 2009; it continued with Shin-Ulchin 1 and 2 whose construction is just underway. Also under construction in the United Arab Emirates is a four-unit nuclear station using the APR1400 design referred to as the BNPP or Barakah Nuclear Power Plant. Planned but not underway yet at the Shin-Kori site are two further units, to be Shin-Kori 5 and 6. Shin-Kori 3 is expected to be on line in commercial service in September 2013 followed by Shin-Kori 4 one year later. Shin-Ulchin 1 and 2 are expected online in 2017 and 2018; no dates are set for Shin-Kori 5 and 6. The ROK has almost completely established itself as a supplier of complete nuclear generating stations; figures from KAERI indicate that averaged though the various myriad power plant systems of the most recent plants built, an average of 95% of the materials were manufactured in Korea. The above article was constructed using printed reference material from the following: Korea Atomic Energy Research Institute (KAERI); KEPCO International Nuclear Graduate School (KINGS); Global America Business Institute. Also consulted were internet materials developed and published by KEPCO and KHNP, and the KAERI Nuclear Training Center. Details of the progression of the ROK program were obtained from an article published in 2010 by the Korea Herald. "The Atomic Energy Deskbook," John F. Hogerton, 1963 provided details of the initial Korean agreement with the USAEC and the TRIGA reactor. Also consulted was "Systems Summary of a Westinghouse Pressurized Water Reactor Nuclear Power Plant," Westinghouse Electric, 1971. The WNA website was used for construction start date and criticality dates for some plants mentioned in the article. The article above is entirely a new construct which, except for some dates as mentioned obtained from WNA is entirely sourced from official Korean industrial materials or the Korean press. Illustrations from KEPCO or KAERI related websites except that of Palo Verde, which is in the APR collection. 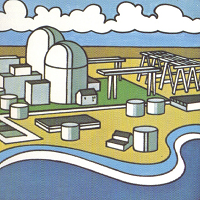 Above, dated but nevertheless interesting illustration of the Kori nuclear power complex. 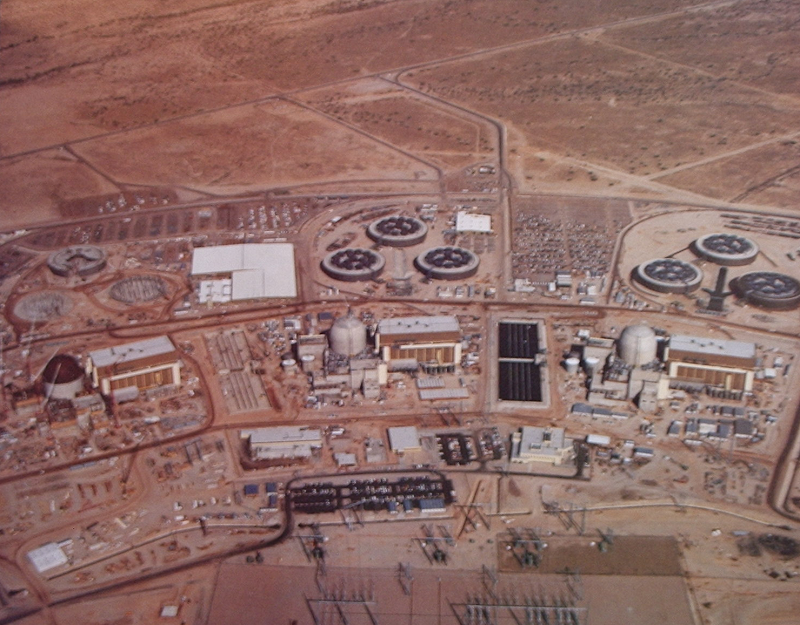 Original Kori nuclear station is at bottom, containing (to the left) the two original Westinghouse "turn-key" plants Kori-1 and -2, and next to them the larger Kori-3 and -4 plants built slightly later on a component contract basis. In this outdated picture, Shin-Kori 1 and 2 (which are now completed) i-OPR1000 plants are under construction, with the sites for APR1400 plants Shin-Kori 3,4,5 and 6 identified. 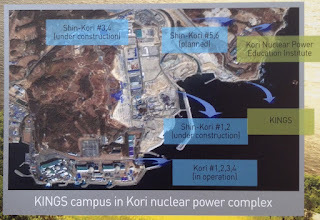 Both the KINGS and the Kori Nuclear Power Education Institute are also parts of this complex. 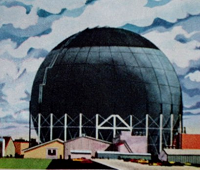 Illustration from KINGS brochure. Lovely looking plant site, but it is really sitting on a mountain or that an illusion, especially what the river there? @Jim: I believe what you're seeing there is an optical illusion. There is a real need to develop more plants like this all over world. Great info you shared through your post. Next to no natural energy resources and a rapidly growing population means managing South Korea’s energy supply is an ongoing challenge. Almost solely reliant on imports, the country’s energy ministry is focused on diversifying supply to ensure long-term energy security, but how is it planning to do this?